It might look like The Rock versus The Towering Inferno from its ticket-selling poster, yet Dwayne Johnson’s latest FX-driven action flick is a terrifically entertaining, exciting 21st century matinee movie with a genuinely progressive innovation, a formulaic crowd-pleaser that manages to do something different amidst all the expected fireballs, chases and exchanges of automatic gunfire. Johnson plays Will Sawyer, a security expert with a lovely wife (Neve Campbell, now 44 and in great form) and two kids whose new job is to oversee the security in The Pearl, the world’s tallest building, which is about to open in Hong Kong. The glittering ediface – one of those dream designs we often marvel at in movies these days – is all done out in self-sustaining, hi-tech wizardry, including its own power generator and multi-level garden. The security and safety measures are especially impressive with backups and fail safes all over the shop. But as we learned from Die Hard, that’s not enough to deter good old human greed, so before the building’s visionary builder Zhao Min Zhi (Chin Han) gets a chance to hold a swish red carpet event he finds himself stuck in his beautifully appointed top-floor office while people with evil intent start a fire half way up the building. This is especially bad news for Sawyer. Not only has he got a major security issue, his family is trapped above the fire while he’s stuck on the ground trying to deal with unexpected plot complications. So, as we all expect from all Rock movies, he goes into action gear trying to get into the building to save his family while warding off all the bad guys who are running about with machine guns and explosives. 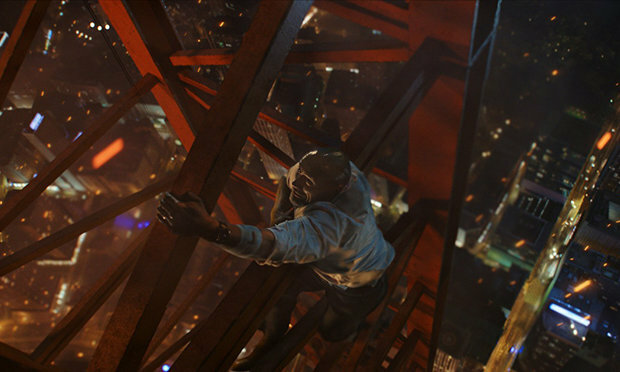 There are some breath-taking, pulse-quickening action sequences showcasing some vivid state-of-the-art visual effects – his manner of entering the building is marvelously inventive and impressive – yet what makes these sequences especially enthralling is that Johnson offers up a refreshing twist on the movie hero archetype he usually plays. After a tragic event during his previous life as an FBI agent, Sawyer lost half a leg and developed an aversion to guns. So instead of the usual muscle-bound, wise-cracking, gun-toting cliche he’s often played, here he’s a vulnerable, disabled family man caught up in a twisted extortion plot. It’s a sizable move forward in the portrayal of the disabled on screen, made more admirable for the way it is intrinsically woven into the plot, thus defusing any charges of tokenism. All up, Skyscraper is a superb action treat, perfect entertainment for the tail end of the school holidays. As a side note, the film also reflects the rapidly growing importance and prominence of the Chinese film market. Set in Hong Kong, much of the film’s dialogue is subtitled, with Asians occupying most of the supporting roles. The names of Chinese production companies, such as the prolific Huayi Brothers (Molly’s Game; Bad Moms; Warcraft), has lately become a regular feature in the opening credits of major films, and it’s not going to stop as Western movie penetration gets ever deeper into the Chinese movie market, which is expected to overtake the American market by 2020. The upside of this: a safer world. After all, the more the Chinese love Western culture the less likely they are to want to go to war with that culture. The downside: muffling movie content to suit the Chinese. For despite its embrace of capitalist values and dalliances with democracy, the place is still ruled by a Communist government that invariably wants any portrayal of China to glow. We’re in for a fascinating ride.